Intel® QuickAssist Technology speeds up the process of encrypting and compressing secure information, meaning end users can send private information with complete confidence. The SFP GbE ports provide exceptional speed, while the conventional ports allow the FWS-2360 to support a LAN bypass function for up to two pairs for four LAN ports to ensure network traffic availability. 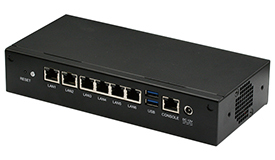 Whether SMB or a cafe or small hotel with customers demanding a powerful WiFi signal, the FWS-2360 can easily carry the software needed to keep multiple computers and devices hooked up and running smoothly.